Orka Holding, which has created its own brands with 100% Turkish capital, entered the men's apparel and textile sector with the DAMAT brand in Osmanbey. Orka Holding, participated in the world's leading fashion fairs and has been taking the first steps to success, the same year the company was covered in a news article of the world's most prestigious fashion magazine UOMO COLLEZIONI with the title "A Star in Turkey" and is the first Turkish ready-made clothing company to do so. Fashion giant arena Damat Tween ADV, became the pride of Turkey with an export of 2.5 million Dollars. Damat Tween won the GOLDEN AWARD and was chosen as the best stand in the Cape Town International fashion show in South Africa. Süleyman Orakçıoğlu hosted at the Orka Holding Fashion Center, the handsome actor of the Yalan Rüzgarı series, Michael Damian, who chose Tween as his clothing style. Damat Tween ADV opened its second store in Switzerland. Damat Tween realised the 2000 Autumn - Winter season catalog shoots with the famous top model Marcus Schenkenberg. Orka Holding brands are present in 13 different countries, and the most recent store opened in Copenhagen. Spring / Summer catalog photo shoots took place in Rio de Janeiro, Brazil. 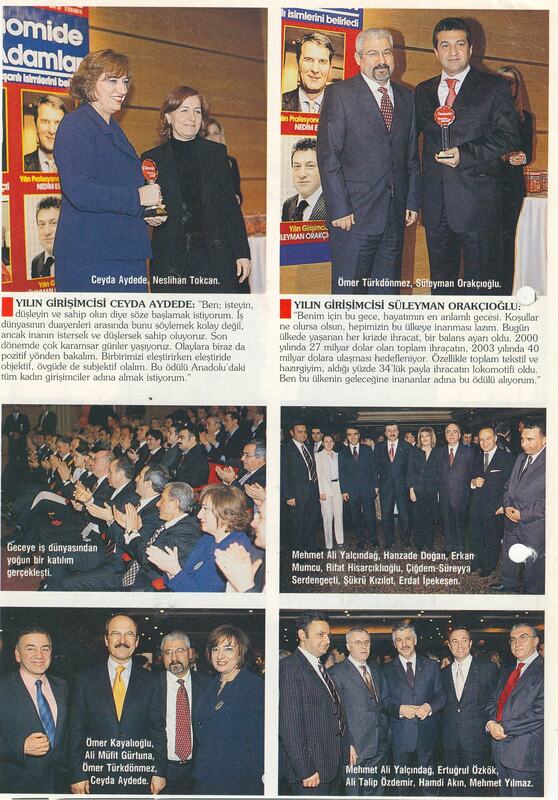 Orka Holding Chairman Süleyman Orakçıoğlu was awarded the "Entrepreneur of the Year 2002" award in accordance with successful domestic and foreign company activities and sector-by-sector activities according to the survey conducted by the Economist Magazine in 2002 by 500 senior executives and business people throughout the country. 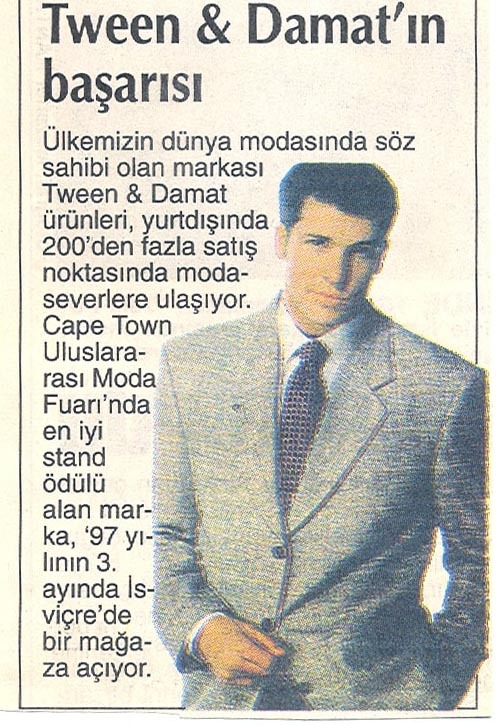 Damat Tween ADV has been awarded the "Most Successful Brand" in the Dünya Newspaper's "Successful Companies of the Year" research due to its performance in 2002 and continued production and exports as well as under consideration of the "quick recovery" criterion after the economic crises. David Bradshaw, one of the most important Creative Directors in the world, signed an agreement to creatively consult the Tween brand. Famous pop-star Michael Jackson bought a tuxedo from the Damat Tween store in Sabco Center, the most important shopping center in Oman. Joseph Mourinho, Chelsea's coach, which is one of the most important football teams in the world, shopped at the Barcelona Damat Tween store. Damat Tween ADV opened its 34th store abroad in Alexandria, Egypt. ORKA Group, entered the Romanian market and opened its fourth store in the country's busiest street, Calea Dorobantilor. The leather jacket which Brad Pitt liked at the Damat Tween ADV Berlin store was sent to him as a gift by Süleyman Orakçıoğlu, Chairman of ORKA Group. In June, at the Fashion TV Fashion Awards, Tween won the first prize in the Best Campaign of 2007 category. Tween participated in the most prestigious men's fashion fair in the world, the Pitti Immagine Uomo, and was chosen the "Icon Brand" of the fair. Four Marketing in London, UK, one of the most important and prestigious showrooms in the world, began selling Tween collections in Studio Zeta showrooms in Milano, Italy. Tween developed quickly to become a world brand, taking its place in London's most important location, Harvey Nichols. Orka Holding, signed an agreement with Malaysian IT-Firm Far Eastern Collection and is preparing to enter far east countries. With this agreement, Orka Holding will deal with Far East countries in Kuala Lumpur, Hong Kong and Singapore. Nicole Kidman bought a cashmere silk T-shirt from the Tween Fall Winter collection for his husband Keith Urban. Liam Gallagher, famous singer of the Oasis group, bought a leather bag and a silk t-shirt from the Tween Fall Winter collection. Harvey Nichols' owner Dickson Poo is also among the Tween customers. Tween, Harvey Nichols started selling in Hong Kong. 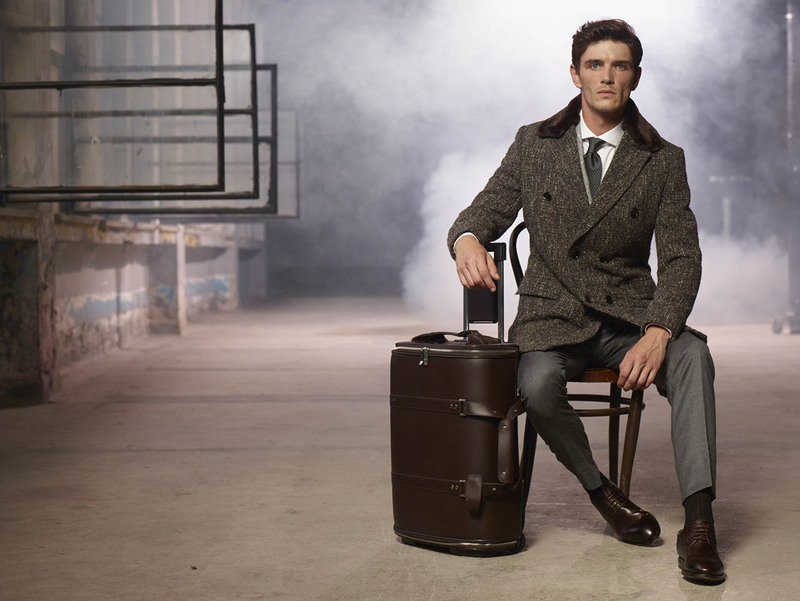 Tween took part, for the fourth time overall, in this year's Spring Summer 2010 collection at Pitti Immagine Uomo, worlds most prestigious men's fashion fair in Milan. The Orka Holding international brand Tween introduced the Tween Womens Collection for the first time in the Fall Winter 0910 festival, which was held at Esma Sultan in the same fashion as World Fashion. The world famous R&B queen Beyonce bought a t-shirt from London Harvey Nichols for her husband Jay-Z. LOADED, the UK's popular men's magazine, chose Tween as the month's brand in February. Another name joins the world celebrities who prefer Tween. Thierry Henry, who ranks first among the world's most famous soccer players and plays in the FC Barcelona Club, made a purchase from Tween Spring Summer season at London Harvey Nichols. Damat Tween ADV's first concept store in the Balkans was opened in Macedonia with a magnificent organization. Tween was invited as the "prestige brand" of Europe by MAGIC FASHION FAIR, the world's most famous fashion fair in the USA. Tween entered the close monitoring of WGSN, the most important and number one fashion portal of the world fashion. WGSN 2010 2011 Autumn Winter created the main page of men's clothing trends with Tween images. Therefore, Tween became the first Turkish brand to direct the fashion of the next year and demonstrated its leadership. 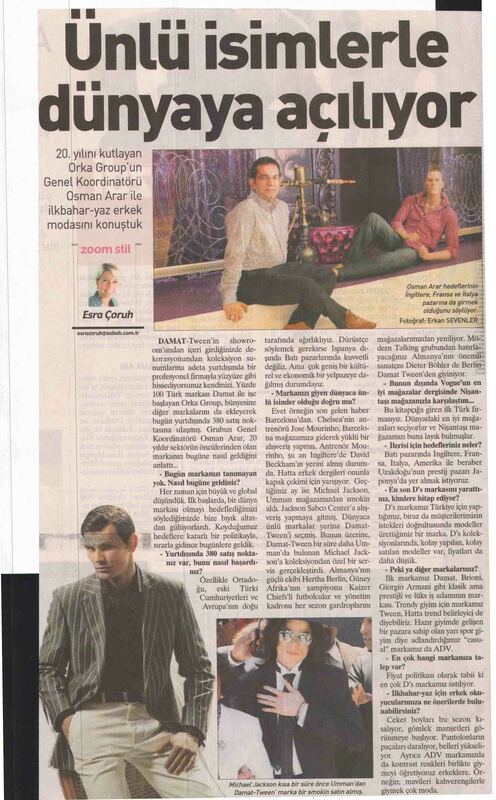 Damat Tween ADV's nanotechnology product group made a big difference in Turkish fashion sector. The UK's most popular alternative rock group Snow Patrol was dressed by Tween for the UK-Ireland tour which started in February. The legendary drummer of the world famous band Beatles, Ringo Starr, entered among the world celebrities who prefer Tween. Chelsea footbal player Frank Lampard's cousin Jamie Redknapp, Southampton's famous football player and world-famous football player Ryan Giggs, who plays in Manchester United are among those who chose Tween from London Harvey Nichols. Arsenal football player and model Freddie Ljungberg, one of the world's most earning football players, expressed his appreciation for Tween's collections at Tween's press conference in London. Brian Friedman, choreographer of world famous singers like Britney Spears, N Sync, Fatboy Slim and Pink is also wearing clothes from Tween. Supporting design and art, Orka Holding, in cooperation with Artgalerim, started to host Artgalerim Nişantaşı on the sixth and seventh floors of the Nişantaşı Damat Tween ADV store and hosts an art activity every month. Tween, with its Fall Winter 2010-2011 collection, attended the most important fashion fairs in America, Project Las Vegas. Valentino, the legend of the fashion world, joined the world celebrities who preferred Tween. Valentino bought a tricot from the Spring Summer season at the London Knightsbridge Harvey Nichols. As it was in 2009, Tween was among the "Brands that shape fashion and determine fashion" at the most important and number one fashion portals of the world fashion the WGSN 2010, with its Autumn Winter 2010-2011 products. Increasing its activity in world fashion, Tween entered the American market and began selling at America Blue Agency and Canada Caulfeild. Damat Tween ADV has started to contribute to nature with its organic products obtained from natural yarns. One of the customers of the Tween store opened in Barcelona was world famous footballer Gerard Pique. Akon, performing in Victoria's Secret, entered collaboration with Orka Holding during the show, wearing the designs of the Aliaune brand he founded in 2008. Famous dancer Dita Von Teese and famous Russian supermodel Irina Shayk appeared on stage at Tween's Istanbul Fashion Week. The brand also celebrated its 20th anniversary with this fashion show. Tween made a debut in London and performed the closing fashion show of the London Fashion Week. Damat Tween nanotechnology to fashion by producing jackets, non-wrinkle clothes, anti-stress t-shirts and water and stain-free suit garments, which are produced with a natural air conditioning effect as well as radiation shielding properties to block cellphone radiation. Damat Tween took steps to present a better future for children by signing a joint social responsibility project with Darüşşafaka on Father's Day. Damat Tween brand won the "Best Quality Textile Company" award within the scope of Quality Awards. Famous actor Matt Dillon was among the followers of the Tween fashion show, which was realized at the Istanbul Fashion Week. Damat Tween introduced magic patterns that would make overweight men look more stylish and fit. The World Intellectual Property Organization (WIPO) for the first time, decided to feature a Turkish company, Damat Tween's introduction film, on its official site. The famous British JLS group participated in the Brit Awards 2012 night for their nomination of the "Best Song", with the tracks they selected from the Tween collection. Don Ottaviano de Medici di Toscana di Ottojano, the last prince of the Medici family, one of the most important families in the world, visited the Nişantaşı Damat Tween store. Orka Holding became a partner by reaching agreement with the famous investment company Investcorp. Tween presented a collection of fabrics that prevent sweating. Orka Holding's 200th and D'S Damat brand's 100th store were opened. Damat Tween won first place in the category of Men's Textile within the scope of the "Research of Most Popular and Preferred Retail Brands in Shopping Centers". Damat added leather shoes to its collection which are produced with a special injection system so that these can be easily worn even in rainy weather. Orka Holding has partnered with designer Pierangelo D’Agostin, who previously worked with world-famous brands such as Jil Sander and Uniqlo. Damat added the world's lightest jackets (160gr) to its collection. Orka Holding decided to completely separate the Damat and Tween brands. Damat Tween was nominated among Turkey's superbrands in the Superbrands organization and received an award. D'S Damat became the official clothing sponsor of Romania's world famous football club Dynamo Bucharest. Porsche, the world famous luxury car brand, chose Tween as a design and marketing partner. The introduction of two new models of Porsche, Porsche 911 Carrera 4S, which Tween reinterpreted for Porsche, attracted great attention. Damat Tween, was the official clothing sponsor of the Turkey leg of the World Corporate Golf Tournament. ORKA Academy graduated 27 new graduates in the 12th Period. The number of executive candidates graduating from the Orka Academy, which provides education in the retail sector within the scope of medium and high level managerial training programs, reached a total of 103 people in 12 periods. Damat cooperated with the Koruncuk Foundation and signed a social responsibility project called "The World Changes with the hands of Women" with 20 women including Nebahat Çehre, Balçiçek Pamir, Gonca Vuslateri, Ece Sükan, Ayşe Arman and Hülya Koçyiğit. The cocktail, which was organized by WGSN and held in London before the 5th Global Fashion Awards, was sponsored by Damat Tween. Orka Holding Chairman Süleyman Orakçıoğlu presented the "Best Sustainable Brand" award to the Amsterdam-based Rambler brand. 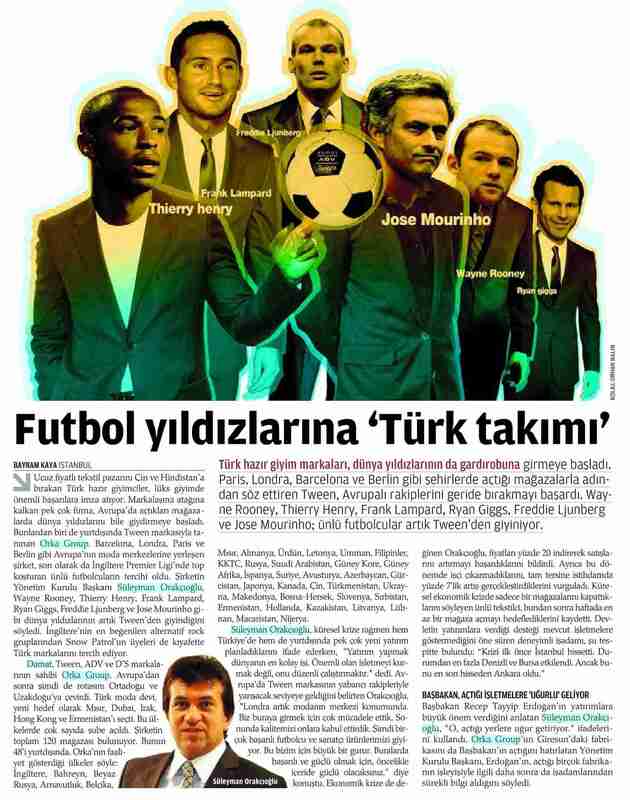 Damat became official clothing sponsor of Trabzonspor, one of Turkey's best football teams. D'S Damat became official clothing sponsor of FK Spartak Moscow, one of the most famous football teams in the world. D'S Damat brand "D'S DAMAT" was chosen as "Number 1 Men's Clothing Brand of 2015" and "Men's clothing brand most favored and most preferred by consumers in shopping malls in 2015". 9 corners were opened in Italy within 9 days under the brand of Damat Tween. D'S Damat, became the official clothing sponsor of the La Liga team Deportivo Alaves. D'S Damat became the official clothing sponsor of the National Team of Macedonia. The Damat brand social media account, was selected the most followed male brand of the year by the Business Life Magazine. 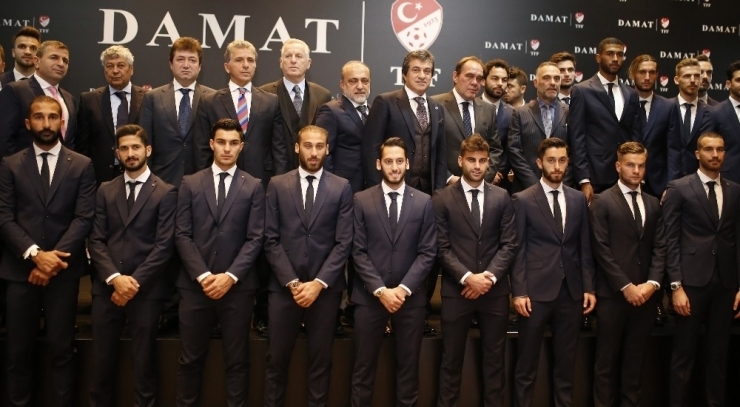 The Damat brand became the official fashion supplier for the Turkish National Football Team. 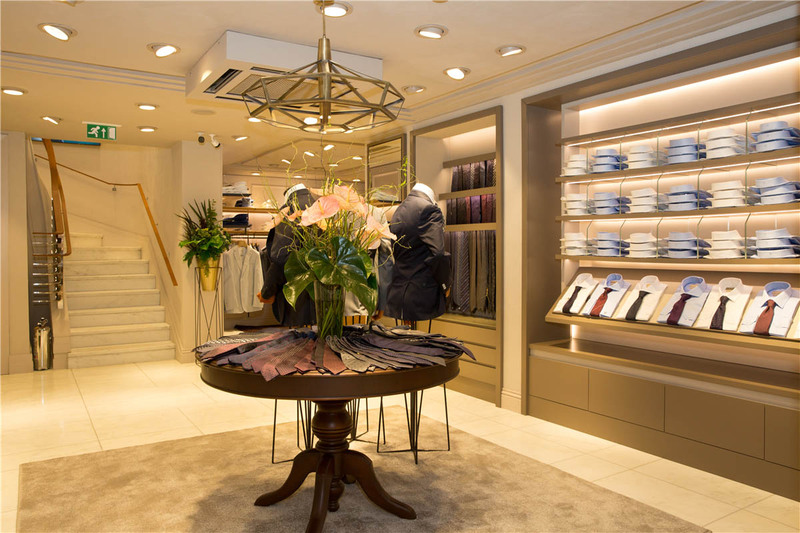 D'S Damat's European flagship store opened at Madrid's Serrano Street.